Dr. Ariana Nelson has diverse research interests including adverse effects of opioid medications, improvement of existing clinical support mechanisms and development of an objective device for the measurement of pain. Dr. Nelson is enthusiastically pursuing translational research avenues with other departments at UCI Health, particularly the bioinformatics division. Through these collaborations Dr. Nelson wishes to help UCI Health build a national research presence in the field of biomedical informatics, specifically the intersection between clinical care and computer science. 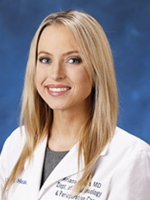 As an anesthesiologist with fellowship training in interventional pain procedures, she is also keenly interested in the impact of different medications and interventions upon patient outcomes. Her current projects include evaluation of side effects of opioids commonly used in the operating room and construction of a clinical decision support system to improve safe but effective opioid prescribing.